Jeanne Groenewald never expected her attempt to feed her family healthy food to turn into one of South Africa’s great poultry success stories. Starting out by rearing 100 chickens in her backyard, she today supplies almost 75 000 free-range chickens per month to leading South African retailers. Jeanne’s free-range chickens enjoying the sunshine. 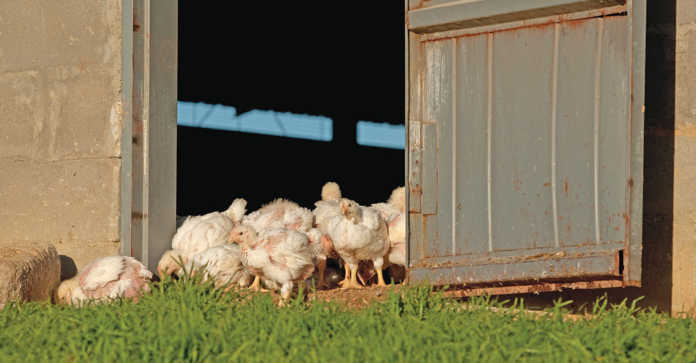 What started out as a small backyard experiment in rearing free-range chickens on Jeanne and her husband Bryn’s farm in Elgin, quickly grew into one of the South African poultry industry’s greatest success stories. “I never drew up a business plan and never expected the business to get this big. It just developed into what it is today. I think it was the right product at the right time, done for the right reasons,” says Jeanne Groenewald. Jeanne grew up on a farm in Wellington. After completing her BSc Agriculture in animal physiology and genetics at the University of Stellenbosch, her father recruited her to run a duck farm he had just bought. A few years later, Jeanne was married and moved to a farm in Elgin. “Our farm is 47ha and we have diversified in a number of ways. Apart from the chickens, we farm with fruit, currently only pears, and have guest cottages for up to 35 people on the farm. This is all run by Bryn,” says Jeanne. “I was always concerned about my family’s well-being and I started worrying about the health impacts of eating processed and chemically treated food. Eventually I reached a point where I just refused to feed my children any mass-produced meat,” she recalls. In 1997 she started experimenting with free-range chickens. Rory Pringle (contract grower) and Jeanne Groenewald. After her friends tasted her chickens, word spread quickly and Jeanne started receiving orders. “Between 1998 and 2000 the business grew from 100 chickens every six weeks to 2 000 chickens per week.” She says the demand dictated how fast they had to grow, and up to the point when they were rearing 2 000 chickens per week, everything was done on their farm. In 2000 a big retailer approached Jeanne and they had to make a leap from 2 000 chickens per week to 15 000 chickens per week to satisfy demand. To accommodate this rapid growth, she approached three contract growers who built the same style houses to accommodate 15 000 birds each. She also established the Elgin Poultry Abattoir in Grabouw, and today supplies almost 75 000 free-range chickens per month to leading South African retailers, selected delis and some of the Cape’s top restaurants. Government and industry are working together to create the Free Range Bill, but there’s currently no regulatory body set out to monitor adherence to the standards. “No-one from the industry or government has ever asked me to prove my free-range claim,” Jeanne explains. This is why she chose to stick to self-regulation, compiling strict specifications for rearing and processing her Elgin Free Range Chickens. All her growers must obtain an environmental impact assessment before setting up their chicken houses. 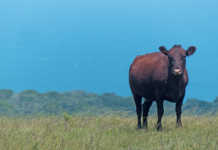 They must build their houses according to free-range requirements, and they must buy feed from specified feed companies. Growers must also farm according to a set of free-range standards and protocols set out by Jeanne. Fifteen birds are run per square metre, compared to conventional commercial broiler farms where 22 to 28 birds are stocked per square metre. “Because our chickens are reared according to humane farming practices, we produce drug- and stress-free chickens,” says Jeanne. 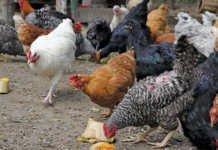 The chickens receive no antibiotic growth promoters (AGPs). In commercial broilers, AGPs are routinely administered to control micro-organisms in the intestines, resulting in an unnatural growth rate. The chickens are also not kept in controlled climate houses throughout their lives. After hatching, chicks are kept indoors for about two weeks (up to a maximum of 21 days in winter). They are then allowed to move around and forage freely between the protective shelters and the outdoors, and naturally return to their shelter at night. “We stock 15 birds/m2 compared to conventional commercial chicken farms with the norm of 22 to 28 birds/m2. Our birds are slaughtered at six weeks, which is about a week longer than commercial broilers,” she explains. They run an eight-week house cycle, allowing for a two-week down time when the houses are sterilised. 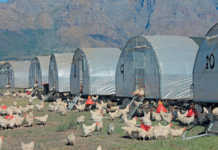 Unlike commercial broilers raised in confined quarters, Elgin Free Range Chickens are treated humanely to reduce stress. This makes them less prone to diseases. The high quality, all-grain diet boosts chickens’ immune systems. “We buy our feed from Profile Feeds and Epol, as they specially formulate the ration for our needs,” explains Jeanne. “Chickens are vaccinated at the hatchery and during their first few days on the farm,” Jeanne says. “We vaccinate for coccidiosis, Newcastle disease, gambaro and infectious bursal disease (IBD). When a chicken falls ill, we work very closely with our avian vet.” Medication is administered through the water supply and all treatment’s withdrawal period is doubled. “Since we don’t administer any routine medication, diseases are always a threat,” Jeanne says. But they have managed to farm relatively disease-free for some time, thanks to chickens being reared as naturally as possible. “They aren’t stressed, so their immune systems are very efficient,” she explains. Jeanne says the demand for free-range chicken is currently stable. “There were no signs of negative growth during the financial crises, but there hasn’t been much positive growth either. I think the selling points for free-range chicken are health and animal welfare issues.